Aww you guys were all very sweet with your nice words about my simple quilt! As a result I was very inspired to keep on working on it today (sometimes when I should have been working). I got the whole top finished - yay! Love the quilt, the fabric prints... AND YOU HAVE AN ELNA LOTUS?!!!! I'm impressed! (...and such a geek!). I love those little machines. Thanks for the tips on photos on my blog. Lara, this quilt is just so so lovely! Your fabrics are making up beautifully as a quilt. Very inspiring! This makes me want to learn to sew! love your quilt. And the colours - they're my favourite. I think I have the same sewing machine - a hand me down from mum - I might have to dig it out - you have me inspired!! You have to start somewhere, right? Great wip shots....it's actually fascinating to see how it all comes together from start to finish. 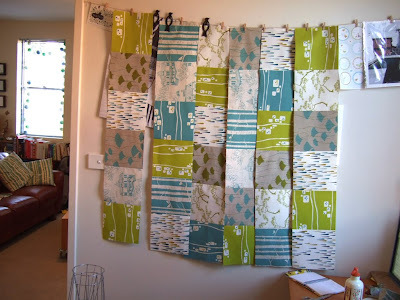 I love the way all of your fabrics look like they belong together in the quilt top. OK, I'm officially inspired. I might have to give it a go. This is stunning! I'm probably most afraid I'll get to this point and never finish. This is where grandmas and great- aunts come to the rescue. Hi again :) That was quick! It's my first gocco print, but I can't wait to try some more. I have just got a new couch and I think it is calling for cushions! 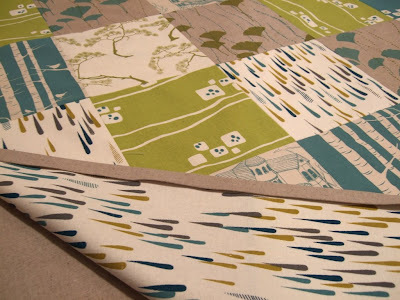 I will have to check in tomorrow to hear more about this gorgeous houses print, now that I've found your blog! Must be exhilarating to see it coming together! House fabric!!!! Yay. 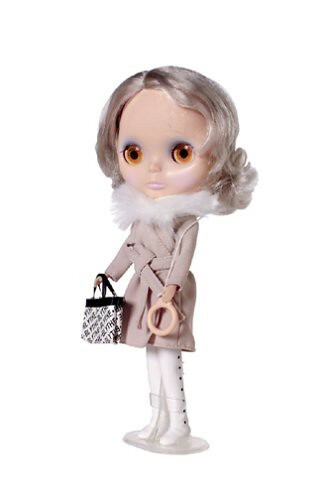 OMG - Do not run out of steam until you let us get our little hands on that HOUSE fabric ...oh I mean ...please???? I have the same sewing machine. But mine will not quilt - it's hand quilting only round these parts! 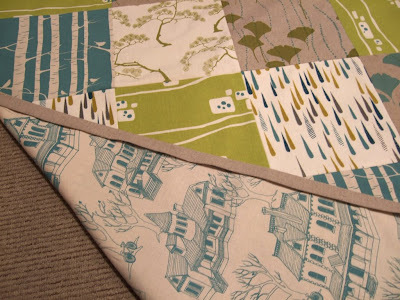 Love the quilt your prints are really special too - it will look fantastic when its finished. I wonder how long it has taken you to make? I used to be one half of Perry & Fowles fabric printers based in Sydney and have a good lampshade manufacturer in Sydney in you want the contact. Just email me and I will send it to you. The quilt is really stunning Lara - the colours are fabulous. And that new house fabric is looking awesome . . . It looks great! I really like the raindrops for the backing. hahaha...I love you last statement! That is totally me! Looks great so far...good luck finishing! You clever thing! That is really lovely. 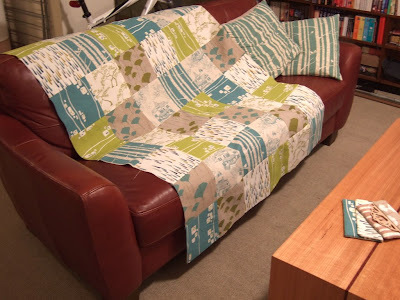 I've made a rather hack-handed "quilt", posted on my blog today. I feel rather ashamed at my poor attempt after seeing your exacting approach! kudos to you! the design is, obviously, gorgeous. can't wait to see the finished product! FANTASTIC quilt!! 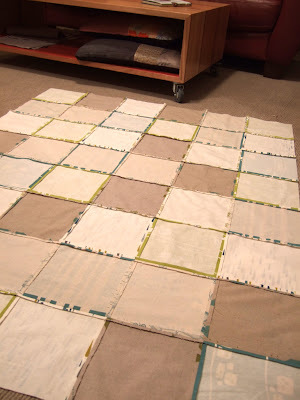 I'm planning to start my very own 1st quilt in a few days and now I feel so inspired! I'm going to sew squares as well. And your fabrics, they work so well together! Look how fast you're getting that done! How?!? Oooooooh...liking that backing fabric. I adore your quilt. So beautiful, and so well made! And I'm very happy you have a little Lotus too. I have one as well, but I've never sewn with it. I think it needs a really good service first! wow, speedy! i'm so impressed. love your colours together. truly divine. great progress shots! your quilting adventures are making me feel like i can do it too! my biggest fear is cutting out lots of even shapes. it's something i struggle with at the best of times! 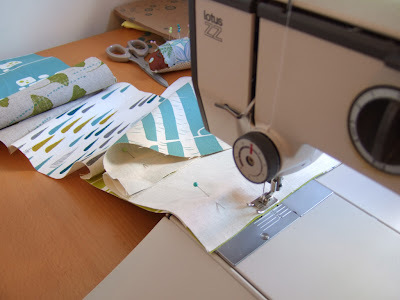 did you use any specific quilting tools or are you just a careful measurer? Hehe, thanks so much everyone!! Oooo, new fabric? Show us more, show us more!! The quilt is a stunner, I sew but mainly clothing though I am feeling a little inspired. Thanks for the sticky beak. Love the quilt, thanks for sharing your process. The colors all look great together. Your quilt looks so elegant with all the fabrics that seem to belong together. 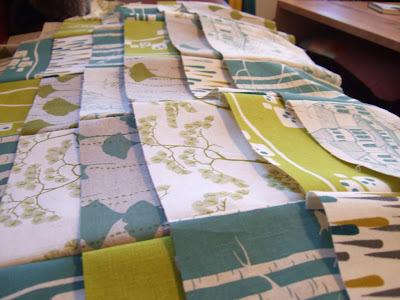 Hope your quilting will work out fine, it takes a lot of rolling up the extra width! Thanks so much for the wip photos! It's great to see it all come together like that. And I agree - the back of the quilt top looks kind of interesting with all the muted tones and the colored seams in between. Hard to choose between those two backing fabrics... they both go so well. Seeing it all step by step might just be the kick I needed to give it a go. Gosh... I've always admired your designs (all the way from the USA)... I live in a Victorian and especially appreciate your lovely sketches. You're in Australia? Never been there... are you looking for a college-aged intern for the summer?! Are you considering putting together a kit for the quilt? 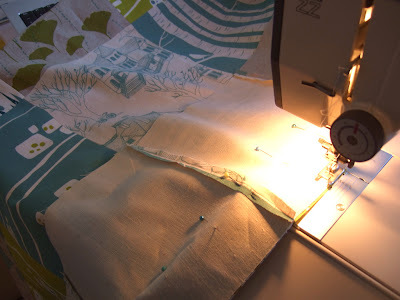 Lovely quilt and fabulous blog! I found you via Skinny laMinx and now you're on my daily read list. Found you via Whip up. Just had to stop by and add my compliments to the many above -- this quilt is beautiful. Lovely, lovely work! Becca - I'm just a small one man band at the moment, but maybe one day! Beautiful prints too by the way - I've just moved away from Melbourne but I wish I'd discovered you sooner! oh my gosh. I'm in love with these fabrics! I live in a pretty small college Texas town and do NOT have fabric options like these to work with. Are these fabrics available for purchase? I would be very interested in seeing more!